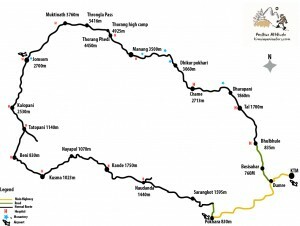 Annapurna Circuit Mountain Bike is the great challenge of mountain bike tours with Himalayan Leaders on one of the most famous trekking routes of Nepal lies close to the Marsyangdi and Kali Gandaki River valley in the Annapurna Conservation area near the belt of Tibet. 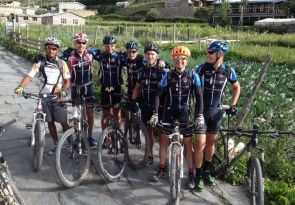 In fact, this is not an easy riding as the route rises all of a sudden to an altitude of 5,416m at the Throng-La Pass but it is an exciting and beautiful adventurous spot well suited to the skillful mountain bikers. The panoramic range of the majestic snow clad mountains of over 8000 meters reflects one of the rarest views to the bike toppers at the top. As this biking route is not 100% rideable along the entire trip, we have arranged sufficient helpers in need to carry bikes and luggage in some parts such as up and down hills, the tough remote trails blocked out by the huge boulders. Teahouse: In Annapurna region, there are best traditional tea house settlements are facilitated to accommodate overnights with the service of delicious continental and local food; cold and hot showers in a clean bathroom are available at every stay for the bike riders along the entire well-defined trails. Therefore, we do not need to carry out any camping equipment or food. Himalayan Leaders will pick you up at the international airport for your transfer to the hotel. As a welcome you will have a typical Nepalese dinner with some of the staff members, typical food coming up! And do not forget to try our typical Nepalese drink with a great mood of cheers. After breakfast, we get acquainted with the bikes and start our adventure with a half-day sightseeing tour of three of the most famous sightseeing spots: first, we visit Soyambhunath, which is a beautiful Buddhist monastery perched at the top of a hill that offers a splendid viewpoint to see Kathmandu city. Next, we cycle to Pashupatinath Temple (the most important National Hindu temple) and will also visit and see Boudha Natha (the world famous Buddhist monastery). These places are of interest because they were built up towards the 5th century, rich in their architecture and religious meanings. After all visiting those historical heritages of great influence, we leave the rest of the day at leisure. At your interest, you can wander around the streets and shop along full with hundreds of colorful shops. 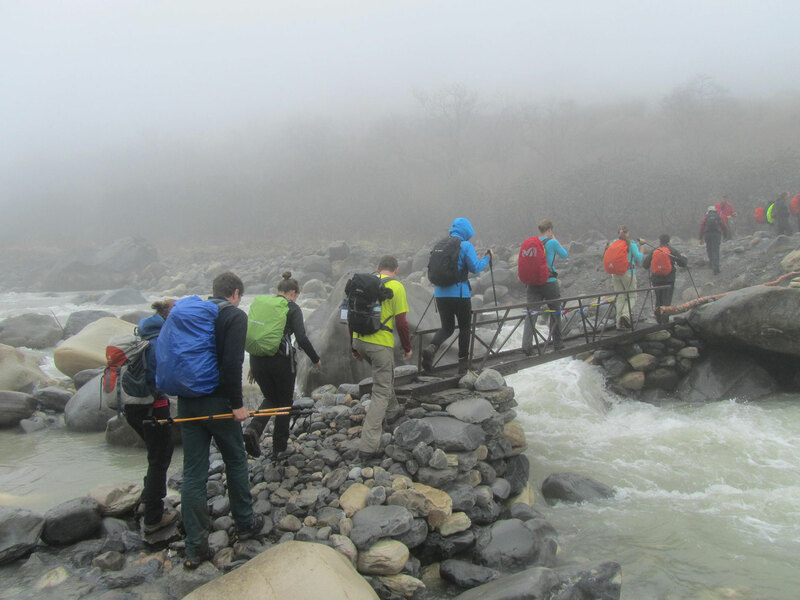 Today Following the Annapurna Circuit trek route to Beshishar, where an impressive footbridge crosses the raging Marsyandi River, a maze of footpaths leads across a small pass and uphill to the Bulbule. Crossing the long suspension bridge over Marshyangdi, the trail continues up the east bank of the river with good views of Manaslu (8156m) to the north-east. Through the villages of Ngadi and Lampata, the trail leads to Lili Bir and continue high above the river eventually dropping to cross to the western side of the Marsyangdi at Syange (1190m) after which the trail becomes steep in parts, reaching the ancient village of Jagat. From Jagat, the trail descends to the Marsyangdi following the riverbank before climbing up through forests to Chamje (1430m). The trail initially crosses the river to the east bank and climbs up to the large settlement of Tal (1675m), where there are many shops and lodges. As you cut through a narrow field from the village, the Dudh Khola, which originates from the south face of Manaslu. The Marsyangdi River then veers to the left, and as Annapurna‘ll become visible ahead, you arrive at Bhgarchhap, a Bhote village with prayer flags fluttering in the breeze around Buddhist Monastery. Continuing climb through forests of pine and oak, the trail goes through flat leave until you reach Chame where there are government offices, shops and, hotels. Chame is the district headquarters for the Manang district. Today we continue through the drier upper part of the Manang district, cut off from the full effect of the monsoon by the Anapurna Range. People of this region, herd yaks & raise crops for part of the year besides, they also continue to enjoy special trading rights gained way back in 1784. Leaving Pisang, we have alternate trails north and south of the Marsyangdi River which meets up again at Mungji. 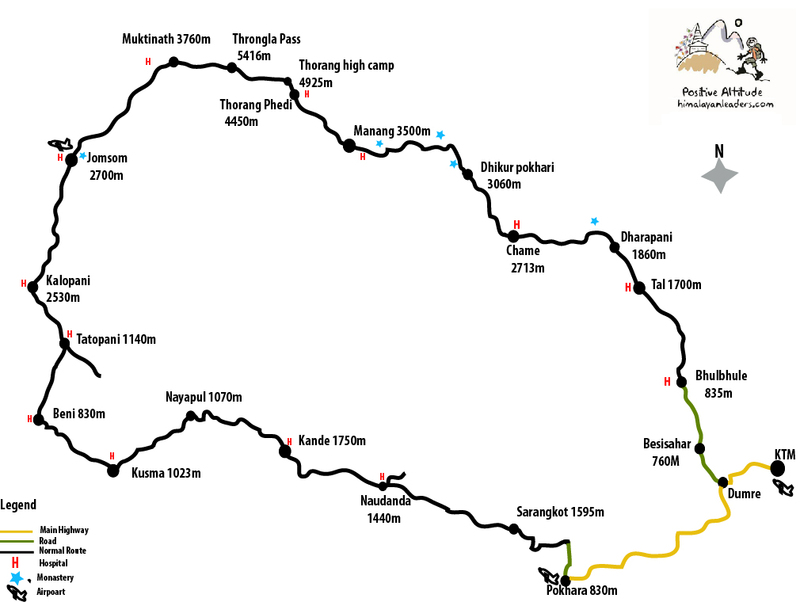 The southern route by Hongde, with its airstrip, at 3325m involves less climbing than the northern route via Ghyaru, though there are better views on the trail that follows the northern bank of the river. From Mungji, the trail continues past the picturesque but partially hidden village of Bryanga. Today we spend a day acclimatizing in Manang. The whole day we spend by doing some fine day walks and overviewing the magnificent views around the village & the daytime is best to gain altitude. At the end of the day, we return back to our accommodation & have a night rest. Today, After a short ascent up the mountain path on the right bank, you follow a narrow trail across an unstable steep slope and then descend to Thorung Phedi. Today we start early for our crossing of Throng-La (5416m). The trail becomes steep immediately on leaving camp but as this trail has been used by local people for hundreds of years the path is well defined. The gradient then eases and after about 4 hours of steady climbing, you reach the Chorten and prayer flags of the pass. The descent to Muktinath is a knee-pounding 1600m but it’s compensated for with excellent views of Dhaulagiri. Eventually, the moraines give way to grassy slopes before a pleasant bike along the Jhong Khola Valley to Muktinath and its shrines and temple. Afterward, we bike downhill, which will be more pleasurable with jeep tracks trails with a mostly downhill gradient! Chill out in this section and enjoy the views of many different mountain ranges. We will leave early in the morning after breakfast downhill from Kalopani to Tatopani via Dhana, Ruptse, Ghasa, The trail follows the Kali Gandaki valley. The river cuts a channel between the peaks of Annapurna 1 and Dhaulagiri thus, qualifying the Kali Gandaki valley for the title of the world’s deepest gorge. We ride through Ghasa at 1630m and one stage takes a precious route through a very steep down at the end you can have a nice bath on natural hot spring where you can enjoy nature sounds of the wildness. 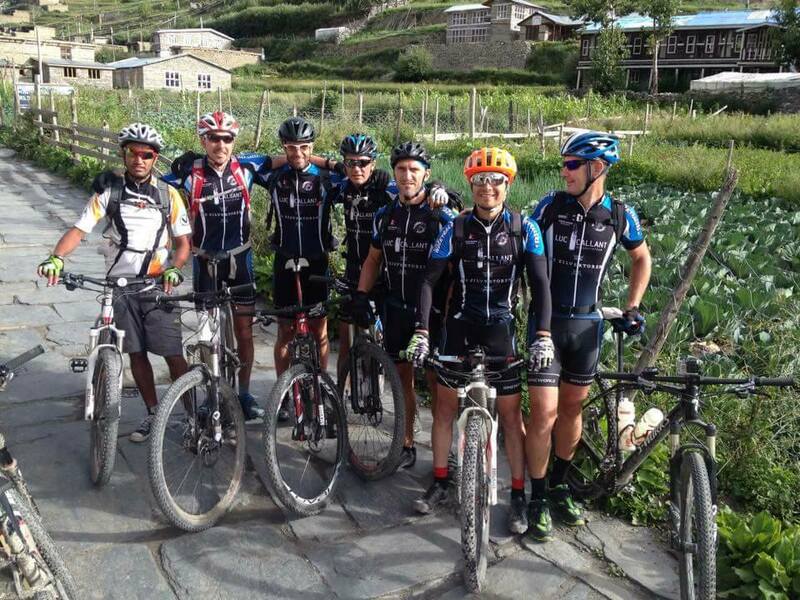 we ride bike Downhill through Kali Gandaki river, the trail rises and falls through small villages with scenic views. This route is popular both for mountain and sunrise view and to experience the Nepalese village life. The viewpoint, Sarangkot offers the excellent panoramic view of Annapurna’s and Dhaulagiri range. Early in the morning sunrise, after breakfast we start our biking, Naudanda offers the dramatic view of the twin tails of Machapuchhre (Fishtail) and the massif Dhaulagiri view. We bike through the Kaskikot village, Naudanda village and the culturally rich Dhampus village where the view of Annapurnas seems very close and we can feel the cool and fresh air of the mountains and continue bike to Pokhara. After breakfast, the biking tour commences. The surrounding area of Pokhara, calm and pollution free, provides an excellent opportunity for trail riding. Biking destinations are Mahendra Cave in Batulechaur village, Davis fall and Cave of Gupteswor Mahadev in Chhorepatan, Tibetan villages’ etc. It is fun riding along the banks of Phewa Lake. You can also go, 15 km east, to Rupa and Begnas Taals (Lakes), which are second and third largest lakes, after Phewa Lake in Pokhara Valley. These lakes, despite being so near, are visited by quite a few tourists. Today after breakfast we leave with many impressions for Kathmandu, either by car or plane. Free day in Kathmandu. Today you can visit Kathmandu on your own and have shopping.